Future Proof Shares - 10/10/17 — Future Proof M.D. I've talked about the 2017 Equifax hack recently. If you are interested in more background information on the credit reporting industry and how Equifax got to where it is today, check out the latest from NPR Planet Money - Episode 798: Bad Credit Bureau. To pursue a career in medicine in America is to pursue a life of delayed gratification. College, med school, residency, fellowship... the training never seems to end! Throughout this long path, trainees rarely have the time to understand what their financial worth is to the system. InvestingDoc discusses Financial Impostor Syndrome Post Graduation and what you can do to protect yourself. Physicians work hard and deserve to be well compensated, both with the respect of society for the services we provide and financially in the form of income. But as often discussed in popular media, how much doctors should get paid can be a point of contention. Dr. Peter Ubel explores how much is too much in this KevinMD guest post - Doctors should be paid well. But how much is enough? As Biggie's posthumously release chart topper goes - "mo money, mo problems". One of the byproducts of you becoming a highly compensated physician is that you become an attractive target for some unsavory business folk. Ryan Inman of Physician Wealth Services explores how you can separate the good from the bad via this Physician on Fire guest post - The Dark Side of Physician Finance: Why You Have a Target On Your Back. Gomerblog is one of my all-time favorite time wasters. The best satire is rooted in the truth. For example, I wasn't quite sure whether to laugh or cry when I read this classic - Doctor Achieves Lifelong Dream of Quitting Medicine Forever. 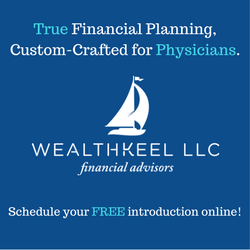 Chad Chubb, CFP ® founded WealthKeel LLC to help physicians navigate the complexities of financial planning. Today, we utilize true financial planning and custom-craft plans for residents and young doctors in the Philadelphia area and across the United States. From investments to insurance and student loans to goal planning, we tailor a plan to address your specific needs and circumstances. We will be by your side, today, tomorrow, and for decades to come to help you plan and build for all of life’s course corrections. Schedule your free introduction call online and see if we are a good fit for you.